The Cropped Emissive Asssistant is a Photoshop tool that assists in the process of making cropped emissive textures for use in Unreal Engine 3. 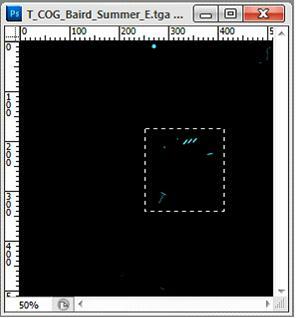 The tool's purpose is to reduce the time and hands-on math required to convert wasteful emissive textures into smaller ones, by providing a means to automatically save out a chunk at the proper resolution, save your selection, and provide the float values required by a special Material Function to place the cropped texture in the appropriate place. NOTE: This tool works with Adobe Photoshop CS4 or later. 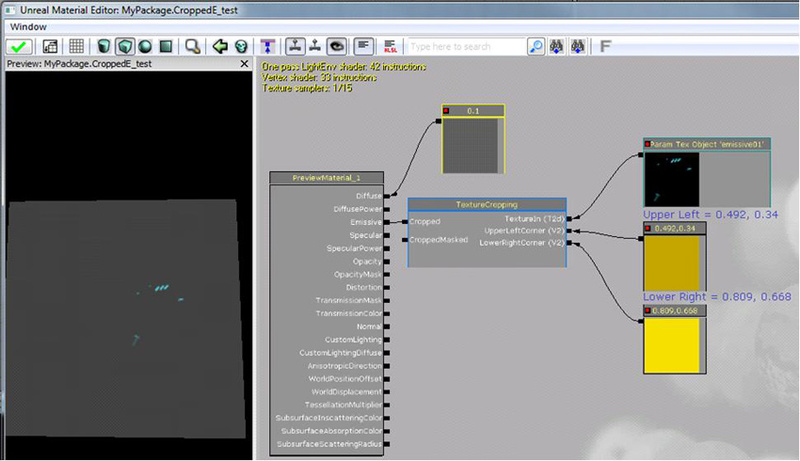 In order to use the Cropped Emissive Assistant, you must first install it. Download and install Adobe AIR , or Adobe Configurator . Adobe AIR is the plugin required. Configurator is a tool for Photoshop that allows you to create custom panels. Navigate to: [Photoshop Installation Path]\Plug-Ins\Panels and copy the Crop_E Assist folder into the \Plug-ins\Panels\ folder within the version of Photoshop you use. If Photoshop is running, restart it. 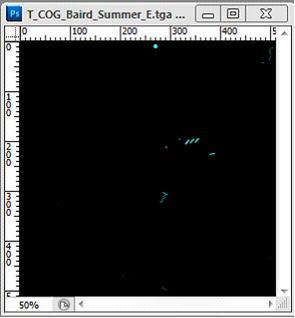 Once its restarted go to Window > Extensions > Crop_E Assist to open the panel. Open your emissive texture, or make that layer group in the PSD visible. The script works with all file types, you can use the PSD file or saved _E tga. An alpha channel will be created in the process to save the selection. Box select the area of your emissive texture you wish to crop down to. The selection does not need to be square, or a power of 2; you can just select the area you need, at whatever dimensions you need. The texture will auto size to square & power of 2. Push the Crop Emissive button. Will be prompted first to manually resize the image if the auto sizing isn't what you wanted. If it is ok, can either cancel, or press OK. Finally, an alert will pop displaying the numbers required by the Material Function. Do not close this window until you input the values to the shader! NOTE: If you saved the file as a PSD, these values are stored in as file's title, File > File Info or ctrl-alt-shift i, for future reference. 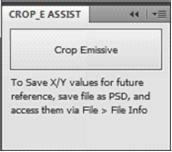 Import the cropped texture that was saved in Photoshop using the Cropped Emissive Assistant. Open the texture's properties (double-click it) and set the Address X/Y properties to to Clamp. Add a TextureObjectParameter expression, and 2 Constant2Vectors. 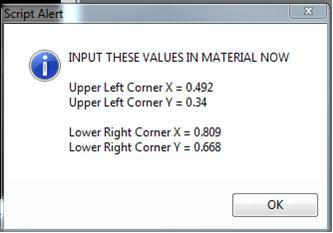 Assign the imported texture to the TextureObjectParameter expression. Connect the output of the TextureObjectParameter to TextureIn input of the MaterialFunction, and connect the outputs of the Constant2Vectors up to the UpperLeft and LowerRight inputs. Input the values from the alert message in Photoshop. Hook the desired output(s) of the MaterialFunction into the rest of the material. A new alpha channel will be created with every click of the button in the Crop_E Assist panel, and would need cleaned up manually currently.